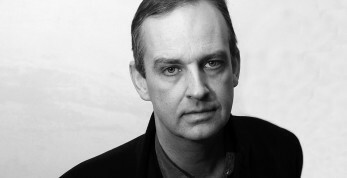 We are currently only able to post to addresses in the UK – those outside of the UK who wish to purchase an item should please contact martha.stenhouse@rsliterature.org or call +44 20 7845 4679. Our annual magazine RSL Review. 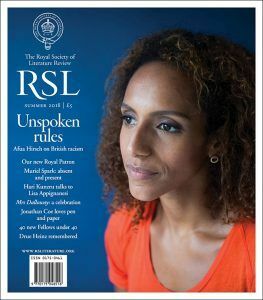 Features include: Afua Hirsch on British racism; Ali Smith remembers Muriel Spark; David Hare on his most precious book; Elaine Showalter celebrates Dalloway Day; Kumar tells a Refugee Tale; Lisa Appignanesi interviews Hari Kunzru. 68pp, soft cover. Published summer 2018. 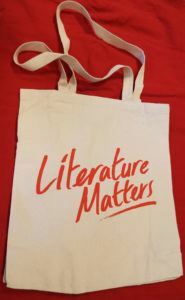 All three Literature Matters products for the special price of £17. Sturdy canvas tote bag with gusset. 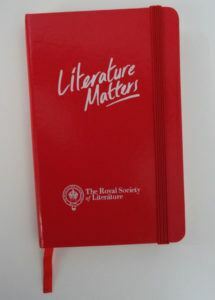 Red 'Literature Matters' wording on one side and red RSL logo on reverse. Environmentally friendly & ethically manufactured. 10oz canvas, 38 x 42 x 10cm. A6 lined notebook with back pocket, ribbon bookmark and elasticated closure. 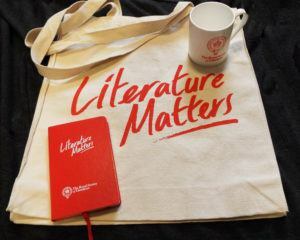 Red cover with RSL and Literature Matters logos. 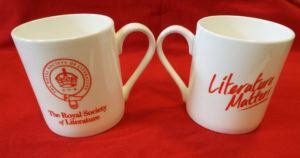 A bone china mug with RSL logo with crest on one side and Literature Matters logo on the reverse. Height: 85mm, diameter 77mm, capacity 300ml.